With seven minutes left in the Alabama-USC game, ESPN’s Cris Fowler and Kirk Herbstreit got wrapped up in a deep conversation in between possessions. The fact that they were discussing the upcoming week of tennis at the US Open, and that Herbstreit picked Andy Murray to win the men’s singles title, says all you need to know about how thorough and complete a beating the Crimson Tide gave to USC. In an opening weekend where the self-proclaimed best league in America bathed itself in mediocrity, Alabama showed the nation that they are ten steps above every other program in the country with an absurd 52-6 win over the Trojans. 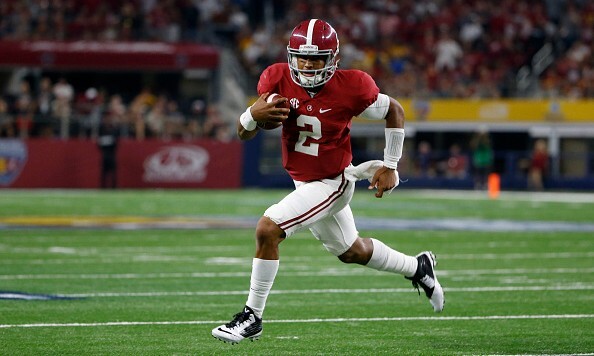 After shuffling quarterbacks early on, the Tide found a rhythm behind true freshman quarterback Jalen Hurts. Hurts accounted for four touchdowns, two by air and two by land, and showed a veteran’s poise throughout his time on the field. Blake Barnett threw for 100 yards as well, but Bama’s offense shined brightest in the run game. Six players had at least 17 yards rushing for the Tide led by 138 yards from Damien Harris. The numbers show how clinical Bama’s performance really was, specifically a 465-194 yardage advantage for the Tide, despite running four less plays than USC. The Alabama defense crushed the Trojans from the opening kick. With six minutes in the third quarter, Southern Cal had 80 yards of offense, and 36 of that came on one play. Even when defensive players got heated on the sidelines in the first half, everything kept humming on the field. Nick Saban defused the situations on the sidelines and let his coordinators do their thing. It was like watching a monster mow down a city. Everything Alabama did was with purpose, and the Trojans were unable to do anything to stop it. The majority of the SEC looked terrible this opening Saturday. Mississippi State laid a giant egg. Louisiana State lost a heartbreaker to Wisconsin. Tennessee, Florida, and Arkansas all severely underwhelmed. Kentucky somehow managed to give away a double-digit lead against Southern Mississippi, and Auburn’s offense looked lousy for much of the game against Clemson. Georgia had a nice win against North Carolina, but no one did what Alabama did. The Crimson Tide asserted themselves as the unanimous top team in America. People will make their predictions for the next four months over what teams should make the playoff, and there is many a good team in America from Ohio State and Michigan to Notre Dame, Houston, and Clemson. But, the Crimson Tide made it very clear in Arlington tonight: until further notice it’s us and everyone else.